StarTrek.com have posted IDW's Star Trek solicitations for September, which is looking like an exciting month! A new TNG series featuring the Borg, titled, Hive, will be starting; the series recently hinted at be Joe Corroney will be written by no less than Brannon Braga! (And it sounds more like IDW's own Alien Spotlight: Borg than Destiny.) 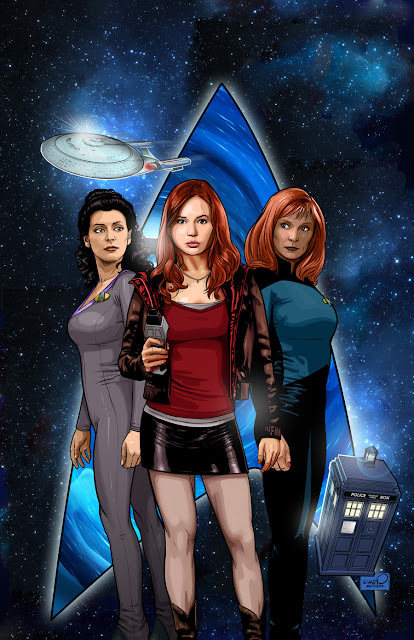 The month also sees a new Redshirt focused story in the ongoing series, the next issue in the TNG/Doctor Who crossover (covers released yesterday), plus a new large format edition of John Byrne's Romulan comics. By Mike Johnson, with art by Stephen Molnar and cover by Tim Bradstreet, plus sketch and photo covers. ...even the crew members wearing the dreaded color are in on the joke. 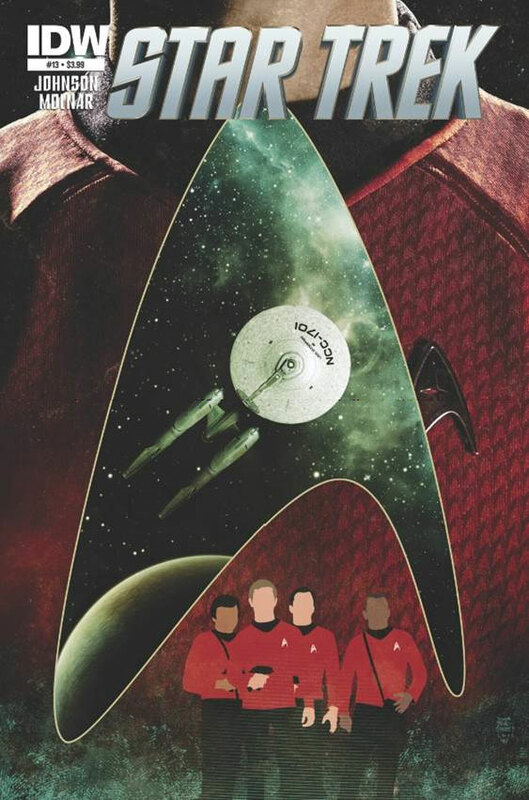 Yes, the story is told from the point of a view of a redshirt on the Enterprise. It was nice knowing you! By Scott and David Tipton with Tony Lee, with art and cover by J.K. Woodward, and alternate cover by The Sharp Brothers. By Brannon Braga and Terry Matalas, with art by Joe Corroney and “Famous Borg in History” cover by David Messina. 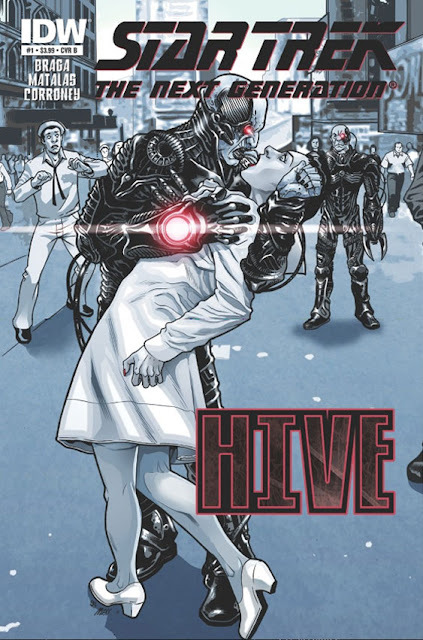 IDW will join in the celebration of Star Trek: The Next Generation’s 25th anniversary with a four-part mini-series entitled Star Trek: The Next Generation: Hive... Hive #1 posits that in the distant future, the Borg and their king, Locutus, have assimilated the whole galaxy. The only hope can be found in the past, with Captain Picard and his Enterprise crew. 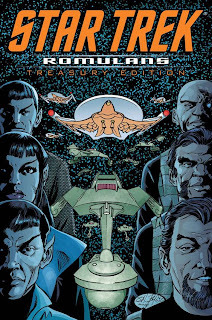 Star Trek: Romulans Treasury Edition, comes from Uncanny X-Men and Next Men veteran John Byrne. And when we say it comes from him, we’re not kidding. 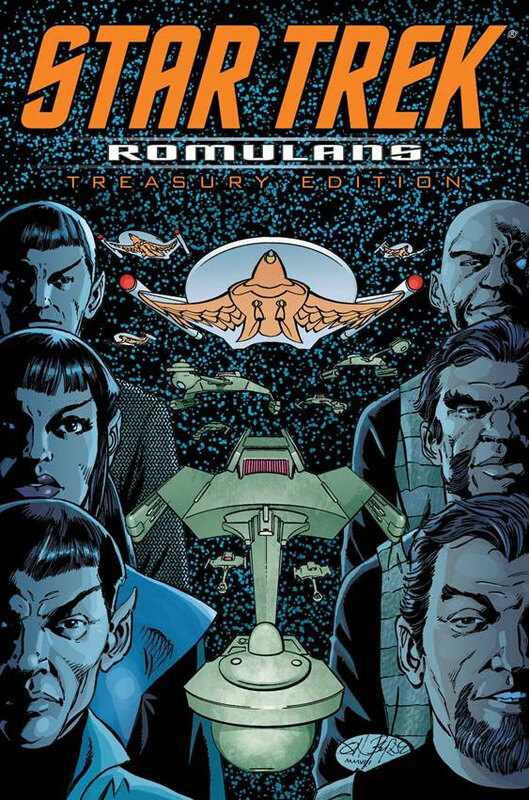 Byrne wrote Romulans Treasury Edition – which compiles three TOS stories featuring the Romulans – and also drew the art and cover. It will run 72 pages, measure 9.25” x 14.25. 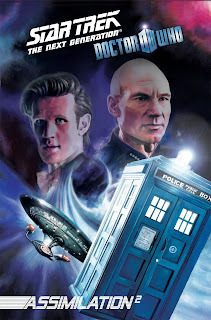 ...the first few several titles in the landmark Star Trek/Doctor Who crossover featuring Captain Picard and the Doctor, the Borg and the Cybermen. While this listing still doesn't officially confirm it, the page count and release date would suggest this will comprise the first half/four issues, of the eight part series.